On the Big Island, beaches are not one size fits all. There are beaches for swimming and beaches for surfing, beaches for socializing and remote beaches where you can enjoy nature in semi-privacy. When you’re ready to get away from your resort beach or want to explore a new shore, these beaches offer something for everyone. Officially called Manini'owali Beach but more commonly known as Kua Bay among the locals, this small white sands beach is a hidden gem. Come for surfing in the winter and snorkeling in the summer. There are no kiosks or food for sale, so plan on packing in your own water, drinks, and food and packing out all your trash. This unusual stretch of shore is the rare seasonal beach. Every winter the white sands wash away and every summer the waves bring them back, creating a pristine parcel that’s a popular hang-out for locals. Coconut trees provide shelter over the rest of the park. Showers and restrooms are available, and lifeguards are on duty. 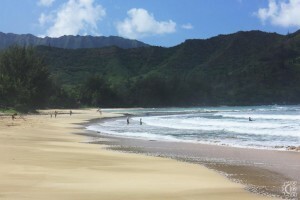 If you’ve headed out on a weekday morning, you may have Pine Trees Beach all to yourself. This stretch of the Kona Coast has a rocky sea bottom that makes it unpopular with swimmers. Instead, most of its traffic comes from the locals who drop in in the evenings to catch a few waves. Their loss is your gain since Pines is a stunningly beautiful spot for a picnic or cookout, or just for sunning yourself on the sands. Overnight camping is available by permit, and you’ll find the beach caretakers onsite to answer questions. Don’t be fooled by the name: Pine Trees Beach has no pine trees. The name is reputed to be an inside joke referring to when a visitor mistook the mangrove stand nearby for pines. Unlike the other less known beaches on this list, Hapuna – which translates as “spring” in Hawaiian – may be one of the most popular on the island. Soft sand and crystal clear water draw travelers and locals alike to the largest of the Big Island’s white sand beaches. Close enough to the Hapuna Beach Prince Resort for convenient access to food and amenities, but far enough for ample parking, Hapuna Beach is ideal for swimming, bodyboarding, and snorkeling. Check the tide conditions before you go – during the winter months the waves may be too rough for inexperienced ocean swimmers. Located off the world famous Mauna Kea Resort, the Mauna Kea Beach (also called Kauna’oa Beach) is considered one of the most beautiful on the Island. The rocks on the south of the beach are ideal for snorkelers to explore, while families can splash together along the quarter mile of calm water. Access, however, can be difficult. The hotel puts aside only 30 spots for day visitors and while those spots are free of charge, competition to get them is fierce. If you go, go early and have a back-up plan in mind. If you do get in, remember to be aware of ocean conditions since there is no lifeguard on duty. Known by the number 69 utility pole at the edge of the parking area, the 69 Beach at Waialea boasts soft white sand above the water and a rich, thriving ecosystem beneath the waves. This sheltered bay is home to coral reefs that teem with sea life of all kinds accessible by snorkeling and scuba diving. Explore the open expanses of the southern side or the rocky protrusions in the center of bay. While the weather in the winter months may on occasion be rough, the trip out is still worth it for the chance to see humpback whales traveling off the Big Island shore. 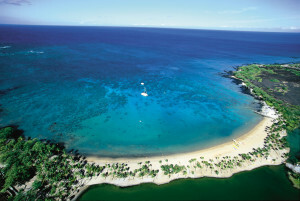 Anaeho’omalu Bay, affectionately known as A-Bay, is a watersports destination in front of the Waikoloa Beach Marriott. Thanks to its location inside a well protected bay, A-Bay boasts temperate water conditions year round, even when other beaches are too rough to swim. At the north end of the beach you’ll find snorkel gear, boogie boards, and even kayaks for rent. Or head out along the trail behind the beach, past two ancient royal fishing pools, tide pools, and a sea turtle sanctuary up to Hilton Waikoloa Village next door. Both the Marriott and the Hilton offer visitors a selection of shops and fine dining options.